After reviewing several early learning math apps I can confidently say that it’s no small feat for a developer to produce children’s math games that stand out. Counting apps tend to be formulaic – but in a good way; the content is based on researched methods of teaching children that produce results. The trick is to make the non-educational aspect of the game as fun as possible to curb frustration and keep players engaged. Alan’s World Counting For Kids has met this challenge head-on and shines as a math app that’s truly unique. 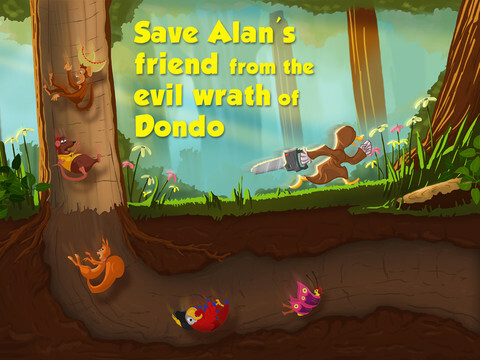 Aimed at players ages 4 to 6, the app presents five different math concepts in an adventure-style context. This is more like a video game than it is an edu-app and it will keep kids interested. There are five mini-games that can be played at three difficulty levels that get harder as the players progress. Kids tackle skills like counting from 1-10, finding the group that doesn’t belong, and comparing quantities to the matching numerals. Alan the owl gives animated directions at each step and provides verbal encouragement and praise. From the initial action-packed opening of this app I knew my 3- and 5-year-old would be instantly hooked. I was right – together they dove right in to the games and followed the story line. While they really enjoyed the games it seemed as though 15 rounds in each were too many and they seemed to become distracted about halfway through. This app is free to download and levels can be unlocked for $0.99 each or $2.99 for all. 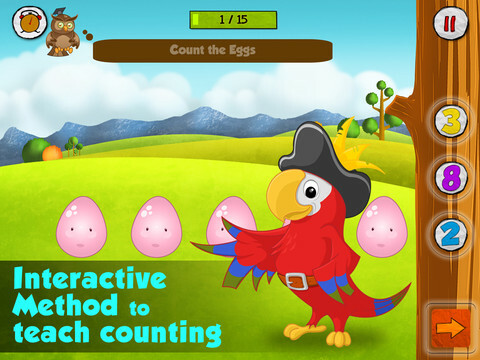 Aside from the length of each level, Alan’s World Counting for Kids is refreshingly different. Your kids will love going on this math adventure!